Irish Artist: Biography, Paintings, Exhibitions, Collections: Portrait Painter, Landscapes. 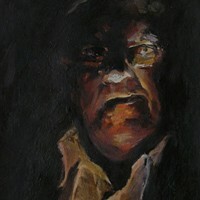 Pat (oil & tempera on gessoed board). Despite the classical technique which is so evident in her work, MacCormick did not go to art college after leaving school, a mistake she only rectified in her mid-30s when she eventually decided to enroll as a mature student at GMIT, Castlebar, Co. Mayo. 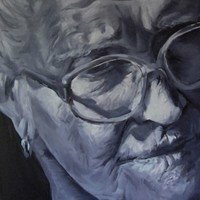 She currently combines her studies with her professional practice as a portraitist and artist, and has so far shown her works only in local venues. Her work has been purchased by a number of private collectors. MacCormick works in a very wide range of media, drawing with pen, pencil, charcoal, pastels, and painting in oils, tempera and watercolour on a variety of backgrounds. Her favourite medium, however is oils. "Although, both tempera and ink are challenging and enjoyable, I have to say that oil would be my medium of choice." As mentioned above, her chosen genres include Impressionist-style landscapes, subject-paintings, figurative studies from life and sculpture, as well as portraiture which remains her favourite form of expression. As befits someone whose influences include the great exponents of dramatic chiaroscuro - Caravaggio (1571-1610) and Rubens (1577-1640) her work combines tension with harmonious composition. Although she illuminates her subjects in different ways in order to display their character, she favours the use of more dramatic lighting angles to produce a more evocative effect. In addition, being also influenced by the exactitude of the disciplined British painter Ewan Uglow (b.1932) as well as the intimate realism of Lucien Freud (b.1922), MacCormick can also produce quieter, less dramatic portraits of no less intensity. Although she is still learning, still experimenting with both subject matter and style, one can't help feeling that her prodigious talent, combined with her exceptional powers of perception and empathy, will take her wherever she wants to go. In my opinion, MacCormick is a must for any collector looking for top-quality emerging artists. I urge you to visit her website and see for yourself. Review written by Neil Collins (Editor) (December 2008).  For more about contemporary arts, see: Homepage.  For details of famous painters and sculptors from Ireland, see Famous Irish Artists.